This has been such an exciting week! I celebrated my birthday on Monday and had a beautiful day of gardening and enjoying good food and drink with friends. This birthday was the start of a new 7 year cycle for me. It is the start of the 7th time through the 7-year cycles, so this is a big one. 7 years ago at this time I started on this journey when I published The Birth of Magdalena. I wanted to share my story of healing through mothering to help inspire other women to find their voice and stand in their power. You certainly learn a lot about people when you start speaking your truth and telling your biggest secrets. I still had a lot of growing to do as I gained confidence and practiced coming out into the light, gently and slowly. When you come out to those closest to you, sometimes they really wish that you would go back into hiding. Maybe they want you to stay safe. Maybe deep down it comes from a place of love and they are trying to protect you. Breaking the silence is the key to healing. What is speaking your truth is what terrifies you the most? I am ready to celebrate with people that are proud of how far I have come, not ashamed that I speak about the things that are hard. When I see young girls going through the same kind of struggles that I faced when I was their age, I know that we have a long way to go in healing these wounds for our whole culture. I do my piece for myself and for my family and for the girls that I mentor, but I want my work to reach further, because there are so many more children out there who still believe that they can be ruined and broken by the things that happen to them, and by the people who hurt them. Those children need to know that their true self can never be broken. They can never be ruined. Underneath it all they are pure and beautiful souls, and they can heal. When we stop blaming and shaming, we can heal. I have tried to let myself come gently and slowly out of the cocoon. When I first tried to come out into the light, I realized the hard way how much our culture does not blame the abusers, they shame the victims who speak up. I was tempted to remain silent. It would be safer to continue to hide. It would certainly make everyone else more comfortable if I could make small talk and pretend that everything is fine. So, on this important birthday, I needed to break some things. I needed to let go so that I could move on. I had this idea coming to me for weeks ahead of my birthday telling me that I needed to smash my favorite coffee mug. It is a cute mug and it was a birthday gift. I had it for 25 years! It was starting to fade a little, but unlike other mugs that have come and gone, this one has traveled with me from my parent’s house to college and to different apartments and finally to my family home. That mug was given to me by my childhood friend. It meant so much because she remembered my birthday. The story behind that though is that often my family would forget my birthday. I was the one who remembered everyone else’s birthdays, so I had to throw my own parties for myself. Most years that “best friend” would ruin my birthday on purpose just to hurt me. On my “Sweet 16” I sat alone and isolated and broken and terrified. So when I got that lovely mug, I held on to it for so long, thinking that it meant that it could be different now. Deep down I felt so unlovable that I was scared to let anyone get close. I tried to let people love me, but found that I instinctively pushed them away to protect my own heart. So on Monday night, after a beautiful birthday of planting flowers and drinking mimosas in the sunshine with a new friend, I smashed that mug into tiny pieces with a sledgehammer. It took me all day, because I started many times but then I would feel guilty. I usually fix things. I have many mugs with glued on handles that still work fine. Finally, I just did it, very unceremoniously, because it has already been given too many of my thoughts and too much of my energy. I put it in the trash and I’m sending it away. I had thought of burying it in the yard, but I don’t want it here anymore. I am creating space in my life for better friends and better birthdays, and I am making space in my heart for people that love me. I need to come out of the cocoon so that I can stretch my wings in the sunlight. When I was little I was called “Ugly.” That was my name. With a capital U. My brother still laughs about it, but it is not really funny how deeply that became my identity. I received so much more confirmation that it must be true from so many others along the way. I protected myself by becoming invisible. When people said that my daughter looked just like me, I was so upset because that was such a horrible thing to say about her. It forced me to realize that part of me actually looks like that beautiful girl. Maybe those people who said that were wrong. Maybe I had been beautiful all along. So I had a photo shoot and went with a doula who could hold space for me as I practiced coming out into the light. When she sent me a photo of a woman in a beautiful dress walking in the river, it looked just like a book cover. I don’t like pictures of myself at all, so the universe was daring me to go big this time and share it with everyone. When we see the beautiful butterfly soaring through the air, we don’t always stop to think about how many phases of growth they had to go through in their transformation before they can stretch out their wings and take flight. I share my story with you so that you can know how hard it was and how many steps it took for me to go through all those ugly caterpillar phases, and uncomfortable growth phases. I had to learn to be gentle with myself as I transformed. Now I am ready to invite good friends into my life that love all of the parts of me, including the pieces that are not fit for small talk. With the release of this new book Magdalena Moments, I am also going to be sharing my new healing programs both over the phone and at my home. Stay tuned for all the details. Sign up for newsletter if you want to receive notifications. I am breaking up and breaking out and moving on. Celebrate with me. If you are ready to celebrate with me today and want to know how to help, please order your copy of Magdalena Moments and consider writing a review. The more reviews that I have on Amazon or on Goodreads, then the higher the book with be in searches and it will be easier for other women to find this story and know that they are not alone on their journey. If you are hurting or in pain, or feeling alone and isolated, pick up this book and let it inspire you to take some steps towards healing. You can never be too broken. Your pain is not a punishment. The symptoms are just messages telling you what needs healing. If you need help translating that message, contact me to set up a private healing session. If you want to work through it with a group (over the phone), stay tuned or message me about the upcoming 7 week program. We will read a chapter of Magdalena Moments each week and hold space for each other as we use the “Things to Try” at the end of the chapter. We will be gentle with each other as we start to grow. I am looking for some feedback on times of day that work best for you. They say “Just Let it Go” like it is an easy thing to do, but that kind of surrender takes a lot of trust and faith. For those of us who were victims of childhood abuse or trauma, or those who had insecure attachment for whatever reason, it can be really hard to trust and to let go. Even when you see the patterns and realize how much it hurts to live this way with your fists clenched tightly and your heart guarded so that you cannot be hurt again, it is not so easy to relax and to surrender. I have always loved God and wanted to be of service, but I couldn’t really believe that God loved me. Sometimes we have a vision of the kind of life that we want to have, but first we need to find the courage to let go of what is comfortable and be patient with ourselves as we grow into our full selves. If you are looking for encouragement, support and inspiration as you grow, join me on Magdalena’s Journey. 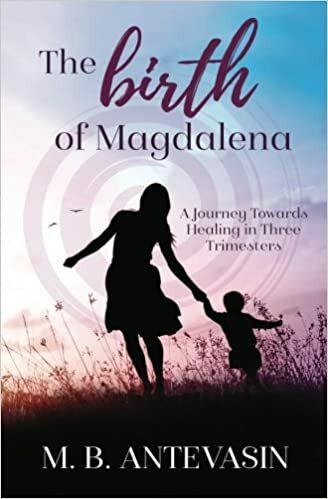 In The Birth of Magdalena, I shared the story about how giving birth to my children woke me up and set me off on a journey of healing through mothering. I realized that I needed to heal to be the kind of mom that I wanted to be, but I had to figure out how to do that while balancing all of my responsibilities. You will find that once you become a mom, you never get to have just one feeling at a time. Motherhood is messy, and challenging, and real. You go through the most powerful moments of your life, and then you go make sandwiches. In this second part of Magdalena’s Journey, I map out seven steps that I have taken towards healing the wounds that were manifesting as physical symptoms. With loving acknowledgement and forgiveness I began to break the cycle of intergenerational family trauma one moment at a time. Follow my story through the “7 Steps to Becoming Your True Self” and let it inspire you to take steps on your own healing journey.